Our Café held on the 3rd Friday of each month differs from the others. 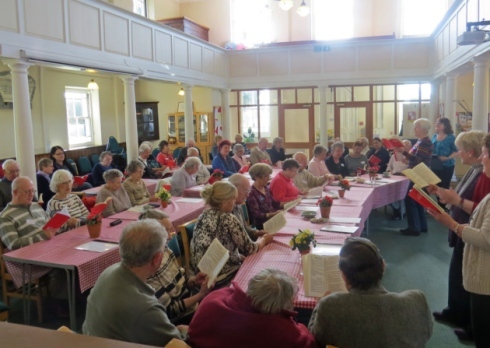 The Singing Café offers those with dementia, their carers and our skilled volunteers the opportunity to sing and play a wide range of musical instruments. This form of music therapy has become very popular with our members and stimulates memory and triggers a wide range of recollections, leading to healthy reminiscence discussions during the break for coffee and refreshments. Large print song books are used although the words to most songs are also projected onto the built in screen. Every one leaves with a smile on their face. We have recorded two CDs. In 2015 our Christmas CD was recorded and sold to raise funds. Come and give it a try – if you need help with transport just ring one of the numbers in our CONTACT menu.